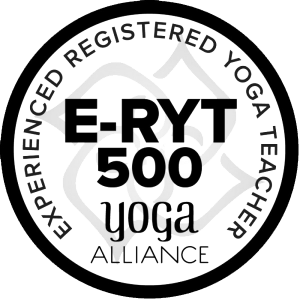 "I was asked about three years ago to name some of the teachers that inspired me to become a yoga teacher and how their teaching has influenced me throughout the years. Though I don't get the chance to see you in person these days I love watching your YouTube channel. I thought I'd extend what I wrote as I came across it today. These are only a few of the things! Shana Meyerson always shows bravery in everything she does! When I think of her I think of handstands and arm balances and what she says about them. "You can do anything if you know the trick." She is brave in her politics, her words, and her actions. Her smiles and fierce integrity make me always want more. Thank you for helping me to be a braver yoga teacher, yoga student and person." "...an awesome, seriously effective handstand tip from one of my favorite yoga teachers, Shana "Keeping It Real" Meyerson. Shana's videos are always awesome, but this is kind of the mother of all yoga videos when it comes to learning, as Shana calls it, "the secret to all of yoga" (and especially handstands). Handstands are hard for most of us. Fortunately, with some major persistence and a few awesome tips from people who really understand bodies and yoga, they are attainable. This video from yoga teacher Shana Meyerson makes what can seem like an elusive secret to core strength into something extremely tangible (yay!)" "You rocked my world! I so enjoyed every minute of our time together and it went by so fast. Thank you for your patience, guidance and willingness to work with me. I’m so lucky to have found you, there aren’t words to express my gratitude. You’ve given me back my practice and so much more. One of my favorite chants has a line that says, "tamaso ma jyotirgamaya" lead me from darkness to light.........and you did! With my deepest gratitude..."
"A little over a year ago, I was in Shana's YOGAthletica Teacher Training and was having amazing breakthroughs in my practice. I'm forever grateful for the experience. The knowledge that was shared in that room, the laughs and tears...ugh, it was more than worth it. Love you, Shana!!! & all the babes who completed that time with me. Seriously one of the best things I decided to do in my life." "A gifted and inspired teacher and practitioner, Shana somehow manages to combine alignment, athleticism, technique, flow and a constant awareness and overlay of a simple spiritual connection. Be prepared to work hard but Shana's excellent instructions take you to your limit without undue stress....She'll have you accessing the power in power yoga. What she offers...is a steady stream of checkpoints and corrections that utilize the body, mind and spirit and takes you into an experience of a truly balanced practice. Intelligent, dedicated, constantly seeking new means of expression, Shana is a teacher I can't recommend highly enough." "I've never been in a class that helps us into positions I've only seen in books, and marveled that anyone could even think of doing it, and you show us that it is possible. I love it, and am grateful for your beautiful gift of sweet, challenging, lighthearted and deep attitude." "Your classes are like no other, and I love your commitment. What I've been saying since I met you is that special people have special missions." "I've been studying with Shana Meyerson for a while now, and have both seen her in person in her yoga studio where I took some privates with her and also follow her Vimeo and YouTube classes online and I've done private Skype lessons with her and she is the real deal. Shana has a strong yoga practice herself, which I respect in a teacher and she is truly a master of the asanas, the vinyasa transitions, and the smart exit and entry into poses with modifications as need be. I live in the east coast or I would be practicing with her all the time. She has such a deep sense of devotion to her students, and a wonderful sense of humor and can teach you ANYTHING you want and teach it safely and smartly. LOVE SHANA and highly recommend her!" "I honestly feel and believe that my yoga practice has grown because of your teaching! I really love your class, your encouragement, and your help! Every class is different and refreshing!" "Totally recommend [YOGAthletica Teacher Training Intensive]. I have just done my 200h this summer and it has been an amazing experience. If you want to decode alignment and learn what classic yoga is truly about, Shana Meyerson is THE BEST teacher for you. She puts so much of focus on making sure you know every single detail there is to know about yoga poses. She structures the training in a way that you learn to teach from day 1. So you don't even realise how the confidence is building in you to teach. One day you find yourself with this bag of knowledge for every single pose you teach that surprises and delights your students. So if you are in doubts - don't be! You will learn a ton!!!" "So I owe a tremendous THANK YOU to the incredible Shana Meyerson for any and all progress I've made in this transition. Without your guidance and inspiring videos to motivate me, even this (which I'm chalking up as a success although I have yet to catch and hold the handstand at the top), is more than I ever thought was possible. Obviously mad love to all of my teachers and fellow yogis, but I owe that "ah hah!" moment to that first day I was fortunate enough to click on Shana's YouTube channel." "As always, I really appreciate your comments and corrections…Thanks for your positive feedback—coming from you, it's BIG. I can't believe I learned sooooo much from your [200-hour teacher training intensive], Shana. You are a task master, but I think you made me learn/perform at a level I never would have expected to learn/perform in 16 days." "…Your class has really helped me persevere and stay strong through tough times…Through your guidance, practicing yoga has truly been therapeutic and has helped me in the healing process. In ways I really can’t comprehend myself, practicing yoga has been instrumental in providing an outlet for stress, anxiety, and even depression….Through your class, I am learning how to channel that negative energy and focus on positive aspects of life and my future." "Your secret of all yoga video clarified core activation in like 9 minutes when several years of yoga and hundreds of yoga classes and even a yoga teacher training did not. Wow. You Rock! Thank you." "You are truly the finest yoga teacher for what you do--teach yoga positions the right way with good portions of joy and enlightenment." "I feel very fortunate that I found you for a yoga instructor. I really feel that it was through your instruction that I found the clarity to pursue a path of starting my own business." "No matter how much I work out, each time I attend your class I realize I have different muscles I've neglected. I love the challenge!" "My arms were ready to crumple (and they did a couple times) this morning but I felt positively challenged and really liked your description about a second wind, about knowing that we're strong enough, about thinking of other things... definitely breathing is something I forget sometimes. How just focusing on the breath I can get through anything." "Shana Meyerson, your explanations are crystal clear, and the way to dissect postures so we succeed into them, so professional and so precise. Amazing level of technicality made easy and translated in an understandable language, while keeping the practitioner safe. Trust me I spent hours, days, months, years to look for excellent tutorials and you are one of the very best. "CORE CORE CORE""